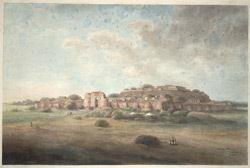 Watercolour of fort at Hansi from 'Views by Seeta Ram from Gheen to Delhi Vol. VI' produced for Lord Moira, afterwards the Marquess of Hastings, by Sita Ram between 1814-15. Marquess of Hastings, the Governor-General of Bengal and the Commander-in-Chief (r.1813-23), was accompanied by artist Sita Ram (flourished c.1810-22) to illustrate his journey from Calcutta to Delhi between 1814-15. Hansi, located in Haryana, is believed to have been founded by Anang Pal, the Tomar king of Delhi. The fort's construction is undated, though additions were made by Prithwi Raj, making it an important military stronghold. A famine in 1783 resulted in Hansi being deserted. The city was revived in 1798 by a British adventurer in Haryana called George Thomas and by 1803, the British established a cantonment here. View of the fort at Hansi, the Union flag flying from the top. Inscribed below: 'Fort of Hansi'.